A sweet melancholy of vegetables with sweet coconut milk. It is not only delicious to taste it, but also to make it. The spices added during tempering blend so well with the final stew, it is very difficult to make out that so many spices where indeed used to make this dish. It makes a lovely combo with Idiyappam/Appam/Paalappam. Wash and cut the veggies into cubes. I have used frozen Peas. You can use green beans too. Heat oil in a deep pan, when it is hot, add cloves, cardamom and bay leaf. Add minced chilies, garlic and ginger. Sauté for a minute. Next add the vegetables and sauté for another minute. Add thin coconut milk and salt to it, cover and cook until the veggies turn soft. Add thick coconut milk and turn the flame to minimum and let it sit on the stove for a minute or two. Do not allow it to boil. Take it off the stove. Serve it along with appam/idiyappam. These stews look so comforting and healthy . Perfect pairing too. The stew looks very delicious.Somehow I have never develop liking coconut milk based stews.But gotta try someday. 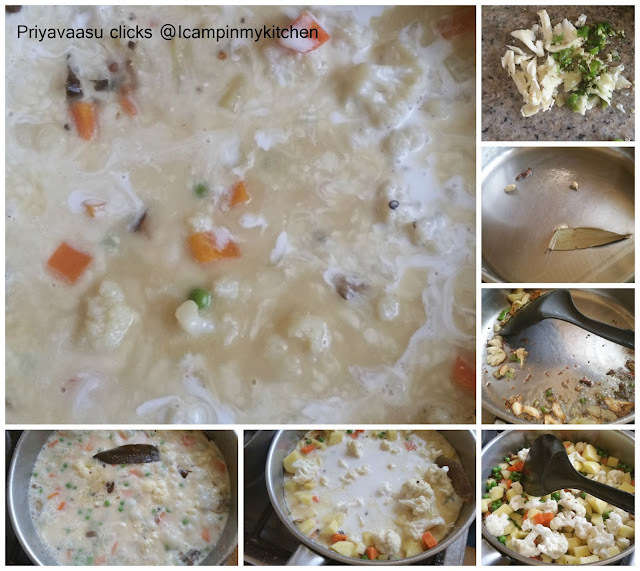 I can never get tired of this dish..you have got such creamy texture to your stew.. It looks delicious & inviting. Mmmmm. What a yummy stew. Love the combo. I have found this to be simple yet flavorful.